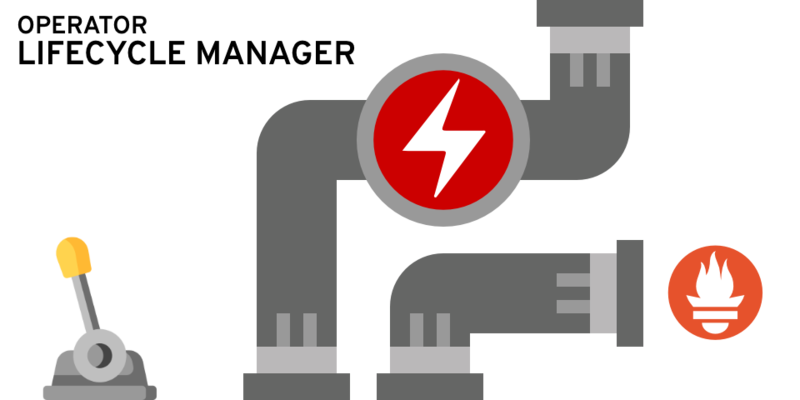 Have you ever needed to install Prometheus or other piece of software on Kubernetes or OpenShift? In general is not a very difficult thing, right? You just process a template, run an image… (At least to a certain extend). The real problems usually surface after what we call day-1… Day-2 operations are not obvious on day-1 but you can imagine some: upgrades, changes in size or even morphology of the deployment, etc. 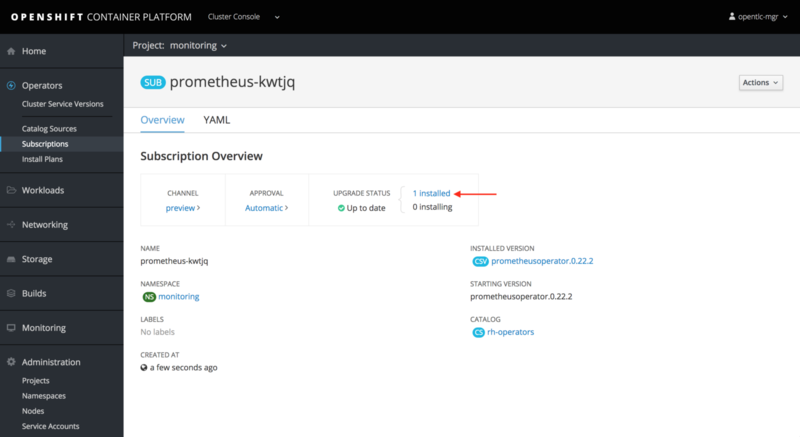 In this article, I explain step by step how to deploy the Prometheus Operator and how to monitor applications which are in a different namespace. 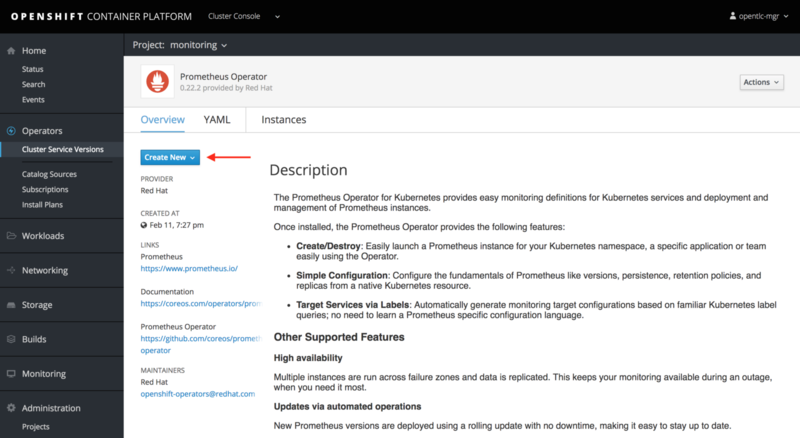 I provide with a step by step guide to deploy Prometheus on OpenShift using the Operator Lifecycle Manager (currently in Tech Preview in OpenShift). I stress on how to check if your configuration is ok and also how to set the operator to monitor application across namespaces. What is the Prometheus Operator? Operators were introduced by CoreOS as a class of software that operates other software, putting operational knowledge collected by humans into software. For further information around the Operator Framework please go here. 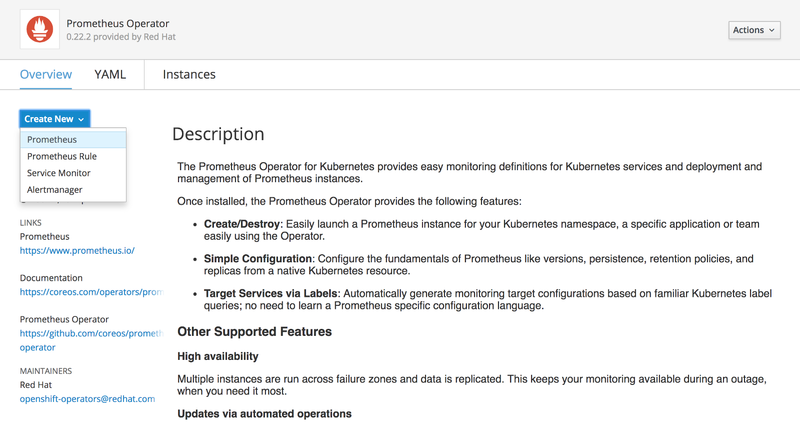 The Prometheus Operator serves to make running Prometheus on top of Kubernetes as easy as possible, while preserving Kubernetes-native configuration options. The Operator Framework (currently in Technology Preview phase) installs the Operator Lifecycle Manager (OLM), which aids cluster administrators in installing, upgrading, and granting access to Operators running on their OpenShift Container Platform cluster. 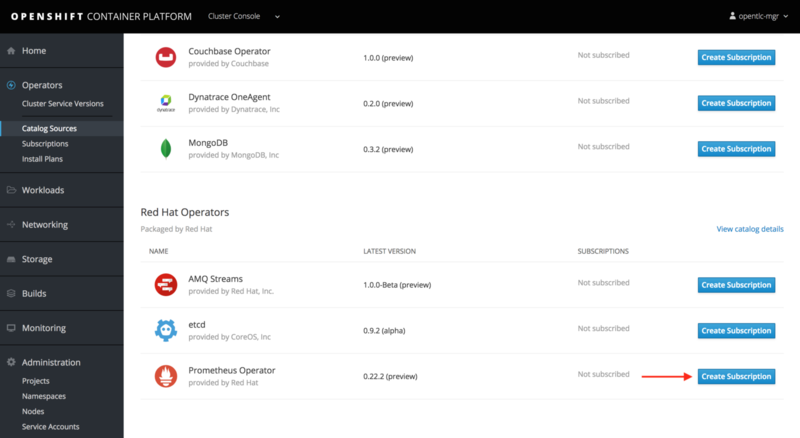 The OpenShift Container Platform web console has been is also updated for cluster administrators to install Operators, as well as grant specific projects access to use the catalog of Operators available on the cluster. One of the Red Hat Supported Operators is the one we need for this lab, this means you don’t need to install the operator itself but to use it. As any other operator there are a set of objects (CRDs) we need to create to tell the operator how we want to install and operate Prometheus. The next command lines show how to grant a user the cluster-admin role and create a project where we’ll install Prometheus. The aim of this lab is to deploy the following architecture. As you can see we need to define a Prometheus server ‘linked’ to a set of ServiceMonitors through a serviceMonitorSelector rule, in this case we’re interested on ServiceMonitors containing label k8s-app no matter which value it contains. Additionally we’ll define a ServiceMonitor containg the required label k8s-app which in its turn we’ll trigger the scanning of Services according to the rule defined in the selector section (matches label teamwith value backend). Finally port property in section endpoints of our ServiceMonitor should match the port name defined in our target Service objects. 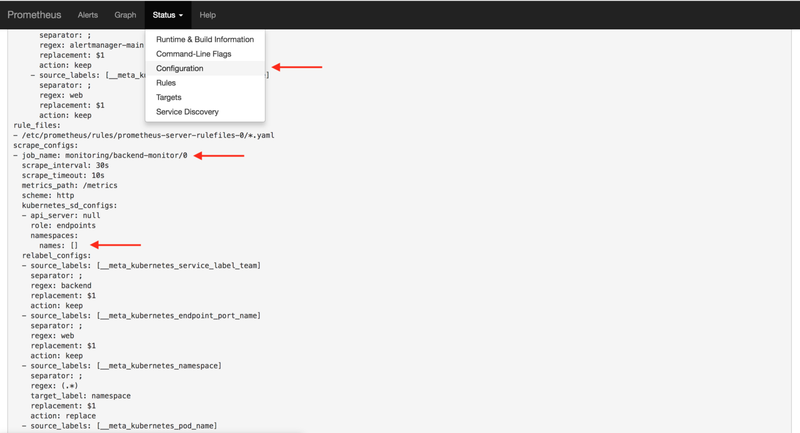 Then go to the Cluster Console and open the Operators➡Catalog Resources menu on the left. There we’ll create a Subscription which the way we manage the Prometheus Operator itself, not the servers. Make sure that the monitoring project we created before is selected before proceeding! Now it’s time to create the Prometheus Operator subscription. Please, scroll down and click on the Create Subscription button close to the Prometheus Operator. If everything goes as expected you should see something similar to this. You should see the upgrade status as Up to date, if that is the case click on the link pointed by the arrow which should take you to the Cluster Service Versions area (menu on the left). You should be able to see the description and links to documentation of the Prometheus Operator along with a set of Create New commands, signaled with a red arrow. 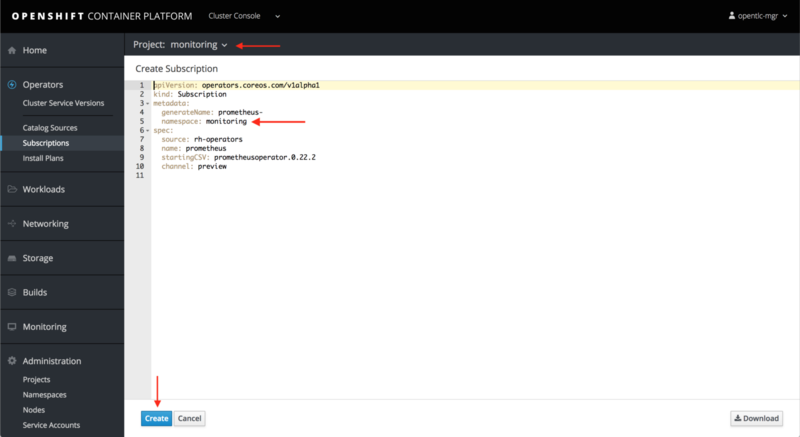 Good job, you have deployed the operator in project monitoring, in fact if you go to the OpenShift Application Console to project monitor you should see one instance of the prometeus-operator as in the next picture. Now let’s proceed with the deployment of the Prometheus server. 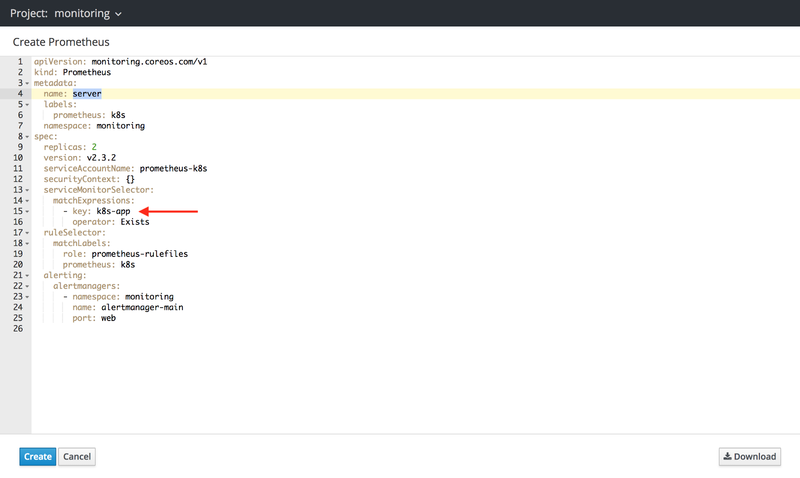 Next screen shows an example descriptor of a Prometheus server, go ahead and change metadata-➡name to server as in the image and click Create. Please follow the next steps to deploy a test application (3 pods) that exposes Prometheus metrics along with a Service that balances requests to the pods. Let’s create a project for our application. Let’s deploy the test application. Let’s check the status of those 3 pods. $ oc get pod -n "monitored-apps"
Now let’s create a Service object to balance to these pods. Please go to the Cluster Console to the Operators➡Cluster Service Versions area. And click on Create Newand select Service Monitor. 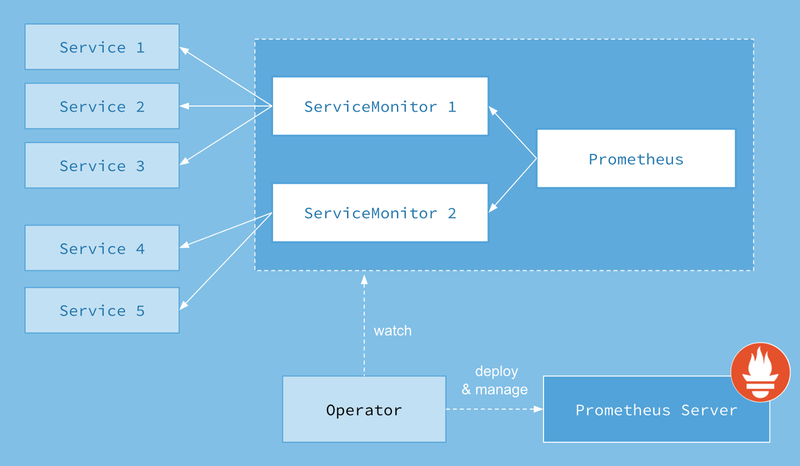 Attention: we are creating the ServiceMonitor in the same namespace of the Prometheus object. 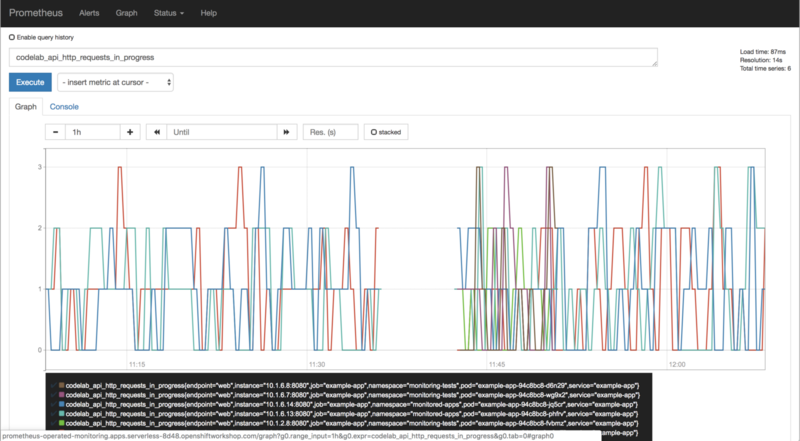 So far we have created a Prometheus server and a ServiceMonitor that points to a Service. Now we should check if everything is fine or not. We can do this by checking Prometheus server logs, but before we do that we need to locate one of the pods, the next command will help us here. Now that we know the name of the pods we’re looking for we can read the logs. Next command gets us the logs of container prometheus in one of the target pods. level=error ts=2019-02-12T10:57:12.739199828Z caller=main.go:218 component=k8s_client_runtime err="github.com/prometheus/prometheus/discovery/kubernetes/kubernetes.go:289: Failed to list *v1.Pod: pods is forbidden: User \"system:serviceaccount:monitoring:prometheus-k8s\" cannot list pods in the namespace \"monitored-apps\": no RBAC policy matched"
level=error ts=2019-02-12T10:57:12.739190937Z caller=main.go:218 component=k8s_client_runtime err="github.com/prometheus/prometheus/discovery/kubernetes/kubernetes.go:288: Failed to list *v1.Service: services is forbidden: User \"system:serviceaccount:monitoring:prometheus-k8s\" cannot list services in the namespace \"monitored-apps\": no RBAC policy matched"
level=error ts=2019-02-12T10:57:12.73929972Z caller=main.go:218 component=k8s_client_runtime err="github.com/prometheus/prometheus/discovery/kubernetes/kubernetes.go:287: Failed to list *v1.Endpoints: endpoints is forbidden: User \"system:serviceaccount:monitoring:prometheus-k8s\" cannot list endpoints in the namespace \"monitored-apps\": no RBAC policy matched"
Well… something is not ok… apparently the problem has to do with permissions over namespace monitored-apps. So what we have to do is grant those required permissions (view) to the Service Account created by the operator and used by Prometheus. We could grant a cluster-role to the service account, this way it can monitor any namespace, as in the next command. Or we can add permissions in a namespace basis as in the next one. Once you run one of the two versions, errors should stop appearing. Further checking… would involve using the Prometheus console… in order to do so we need first expose the Service as in the next command. You should see something like this. There are three targets, one per pod. …and click on tab Graph. This simple guide doesn’t go deep into the configuration of Prometheus, but shows how easy it is to set up Prometheus using the Operator Lifecycle Manager… but remember the real payoff starts on day-2 operations, so what’s easy today should be easy tomorrow too.